The following is the link to a pdf version of my essay on aspects of the compositional style of the late African-American composer, Ulysses Kay. The Music of Ulysses Kay – 2. This essay examines two of Kay’s compositions: his Scherzi Musicali (1968) written for chamber orchestra, and First Nocturne for piano, which was composed in 1973. 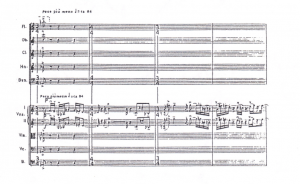 In analyzing these two pieces I aim, firstly, to show that Kay progressed stylistically to be worthy of the classification “full-fledged modernist” and reveal some of the twentieth century Art Music compositional procedures that Kay utilized. In doing so I rely primarily on the tenets of post-tonal musical analysis as outlined in Introduction to Post-Tonal Theory. 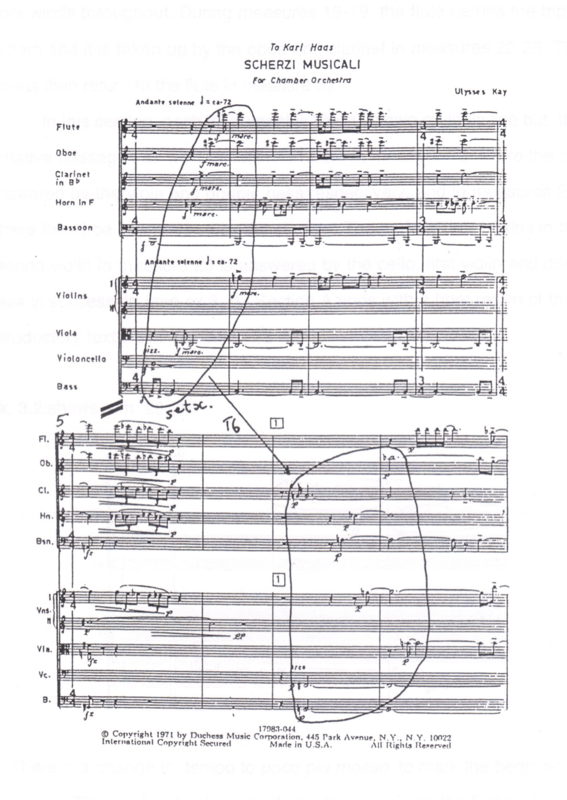 Kay wrote this work in 1968 for chamber orchestra of flute, oboe, clarinet, horn, bassoon, and strings. The Chamber Music Society of Detroit commissioned it on the occasion of its Twenty-fifth Anniversary. 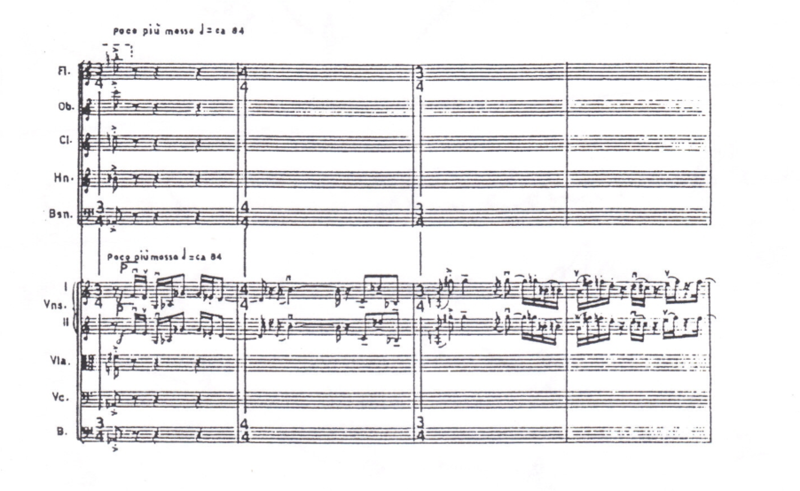 Scherzi Musicali is atonal in its entirety and it shows that Kay had fully embraced twentieth-century techniques of composition. This piece is aggregate-based in which the composer ensures the circulation of all twelve tones of the chromatic scale throughout most of the work. It also presents and develops the all interval heptachord (0123456). The first movement is AB in form with and introduction and coda. The introduction is distinguished by a static texture created by the superimposition of the notes of the heptachord [B, C, Eb, D, C#, E, F] on each other. This heptachord is transposed at rehearsal marking 1 (mm. 7), but the texture remains the same (see ex.1). Ex.1 shows the title page of Scherzi Musicali. Section A begins in measure 13 with the P designation in the flute. 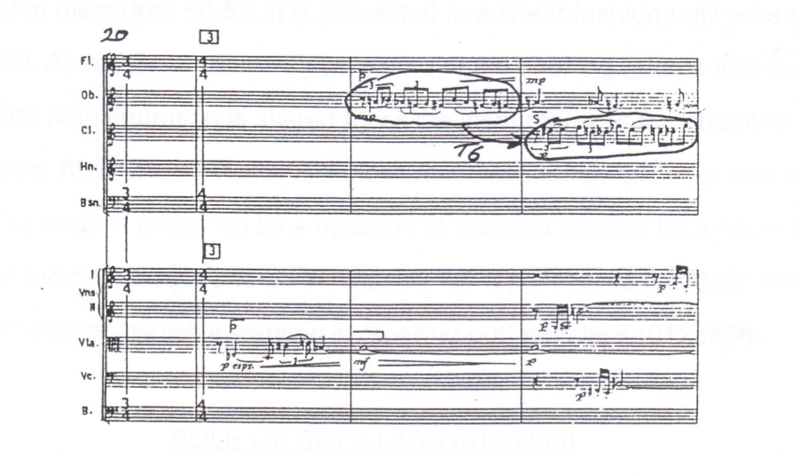 This section presents a linear, contrapuntal working out of thematic ideas and it is characterized by the triplet rhythmic pattern, which is featured in the upper woodwinds throughout. During measure 13-19, the flute carries the triplet pattern and it is taken up by the oboe and clarinet in measures 22-26. The triplets then return to the flute in measure 33. In this section, each instrument is given its own melodic line but there are imitative passages as well. Imitation is heard in measure 13 where the cello is answered by the viola and double bass respectively, and in measure 22-23, where the clarinet answers the oboe. The melody that begins in the second violin is answered by the cello, first violin, and double bass in succession (see ex. 2). Section A ends with a brief return of the introductory texture in measures 38-40. Ex.2 shows measures 21- 23. There is a change in tempo to poco piu mosso to mark the beginning of the B section. This section commences with the violins in unison, the only unison passage in this first movement. This passage, which spans measures 41-45, provides rhythmic contrast to the preceding triplets and possesses a proliferation of sixteenth notes (see ex. 3). Ex.3 shows the first four measures of section B. These sixteenth notes constitute the composite rhythm of the B section. After the strings, the oboe and then the clarinet carry this sixteenth-note figuration in measure 50-54. It is presented in a linear fashion until rehearsal 8 (mm. 55). 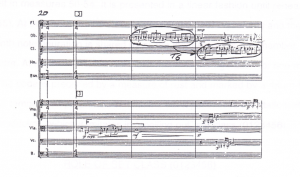 At this juncture, the static texture of the opening returns and all the instruments of the chamber orchestra share the sixteenth-note figuration. At measure 61, the first violin takes up the figuration for one measure. The coda is preceded by a measure of rest and marked by a return to the original tempo – tempo primo – in measure 68. It possesses the static texture of the introduction, which it imitates in “spelling out” set class (123456). 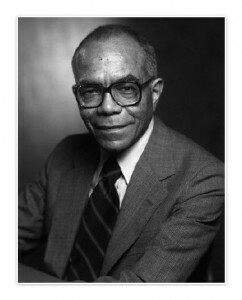 Joseph N. Strauss. Introduction to Post-Tonal Theory, Prentice Hall: Englewood Cliffs, New Jersey, 1990. 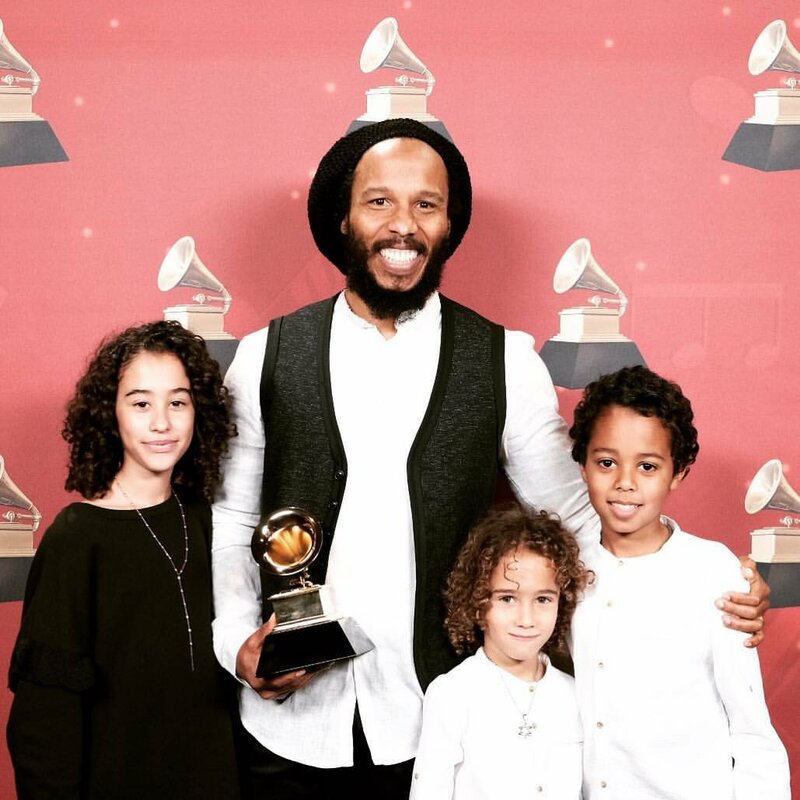 The following is the introduction to an interview with Jose Tarvernier, Haitian musician of the band Ibo Combo. The interview appeared on NPR. From Ricky Ricardo to the Buena Vista Social Club, Cuban music has always seemed to find big audiences here in the U.S.; for lots of people, it’s become the sound of the Caribbean. 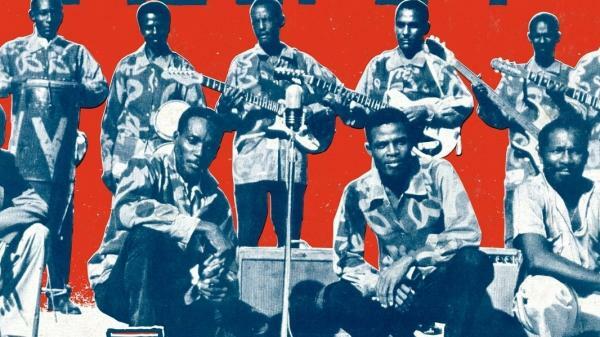 A new compilation hopes to expand our horizons a bit by introducing the sounds that came out of Haiti, before and during the Duvalier regimes. It’s called Haiti Direct: Big Band, Mini Jazz & Twoubadou Sounds, 1960-1978. Mendez unearthed 28 lost recordings. 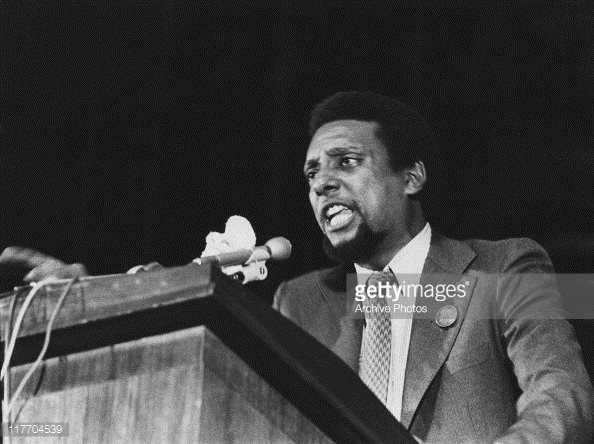 In the process, he got to know some of the people who played this music, many of whom had to flee the country to avoid the abuses of Francois “Papa Doc” and Jean-Claude “Baby Doc” Duvalier. One of those musicians, José Tavernier of the band Ibo Combo, joined Mendez and NPR’s Kelly McEvers to talk about how these volatile years shaped Haiti’s musical profile. Hear their conversation at the audio link.